When Anita Angelovska Bezhoska was given the chance to run her country’s central bank, she almost turned the job down. One of only four women in Europe to run a monetary authority, the 47-year-old former International Monetary Fund economist from North Macedonia said she was worried she’d struggle to balance the job with raising three kids. Now that’s the least of her worries: she’s directing policy in a nation where one in five adults is unemployed and economic growth is recovering from when a political crisis pushed it to the brink of recession two years ago. After the Balkan state of 2.1 million resolved a decades-long dispute over its name, opening the path to membership in NATO and the European Union, she’s also trying to make preparations for euro adoption. 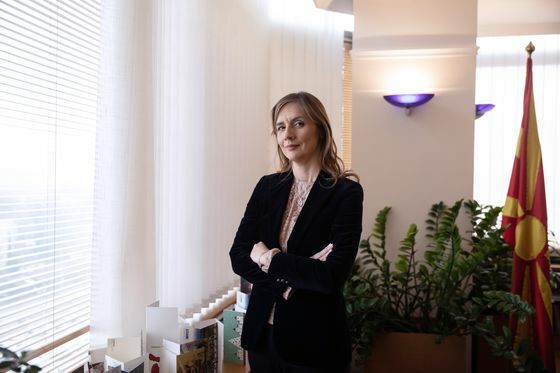 “North Macedonia is a small country that in the past has been exposed to many risks, so being responsible for macroeconomic stability in Macedonia is not an easy task,” she said in an interview in Umag, Croatia. Aside from North Macedonia, Cyprus, Serbia, and Russia have women running their central banks. Born to immigrant parents in Sweden, Bezhoska, 47, spent her childhood shuttling between summers in Gothenburg and school months with her grandparents in the former Yugoslavia. Her first job was at the Finance Ministry in Skopje, when she was tapped to lead the group tasked with establishing a treasury system after her country emerged from the breakup of Yugoslavia. She then moved to the IMF, where she participated in Balkan and Baltic missions. Later she became chief economist for the central bank in Skopje, then a vice governor. When she was selected to become governor a year ago, she almost said no. “I hesitated a lot, because of my family,” Bezhoska said. “My youngest is eight." While EU membership is years away, Bezhoska is already looking at how North Macedonia can adopt the euro. With a de-facto peg against the single currency, and with debt and inflation levels within EU targets, it meets most formal requirements, she said. “We’re connected to the EU in terms of trade, financial markets, so it’s a natural end-point for us,” she said in another interview in Skopje. Bezhoska’s rise has put her into the spotlight in her nation, where most top jobs are still held by men and only 40 percent of adult women work, the second lowest of 35 countries measured by the EU’s statistics agency Eurostat and well below the bloc’s average of 62 percent. That’s something she’s trying to change -- about 60 percent of the central bank’s management are now women, including two vice governors she picked.